Friday February 26th 1892 I took an early start and stopped at Mr Callings to see about the stripe in the carpet. From there I went away down on lower Clinton street to call on Mrs [Primrey?]. I came back up town and was down to see the girls a few moments and got home a little after eleven oclock. I fixed a skirt for myself in the afternoon. I had a severe spell with my stomach in the evening and was not able to attend the K. of P. party. [note: K of P is Knights of Pythias, a fraternal organization] Saturday February 27th 1892 I passed a bad night, called Manly Moon to see me this forenoon and did not sit up a minute all day. Sunday February 28th 1892 I rested better last night and was able to get up this afternoon. Edith was over to dinner and Ott for a few moments in the afternoon. It was a snowy dark day. Monday February 29th 1892 I helped a little with the work this forenoon and worked on my lace besides doing some writing. I feel some better today. Tuesday March 1st 1892 I feel nearly well again. We washed this forenoon and I went to town to see Ott about the Dwight business. Hattie came over home of an errand. I went down and staid with Fanny. She came up town with me as I came home. I stopped at Mr Callings and paid for my new rag carpet that is done. 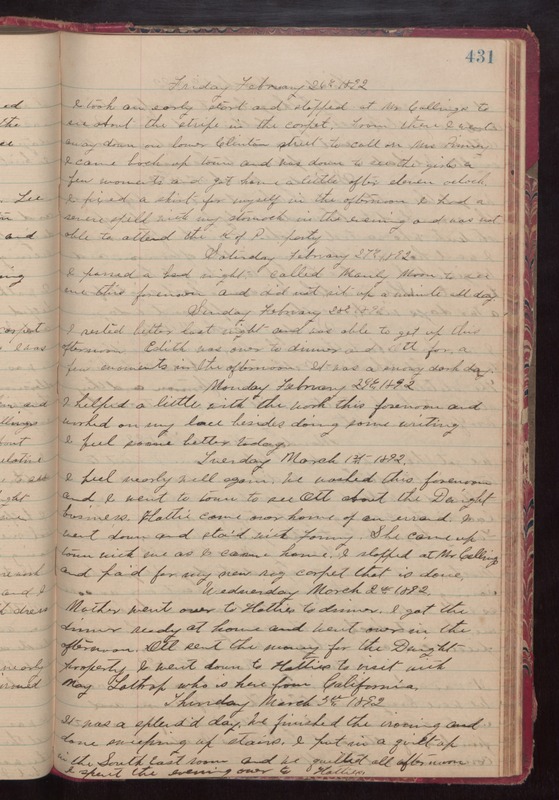 Wednesday March 2nd 1892 Mother went over to Hatties to dinner. I got the dinner ready at home and went over in the afternoon. Ott sent the money for the Dwight property. I went done to Hatties to visit with May Lathrap who is here from California. Thursday March 3rd 1892 It was a splendid day. We finished the ironing and done sweeping up stairs. I put in a quilt up in the South East room and we quilted all afternoon. I spent the evening over to Hatties.